The Spanish wine and tapas restaurant, Taberna de Haro, has changed quite a bit since I first wrote about it three years ago. Last year, we expanded the restaurant to include a full bar, offering bar tapas and mixed drinks. We also increased our patio seating and revamped our menu. And of course, we have our ever expanding wine list, currently with over 320 Spanish wines. In addition to being a server these past few years, I took on the position as a cook last year. It was a great experience to work in the restaurant in the front and the back of the house. I also enjoyed learning more about cooking and about how many of the dishes that we offer are made. 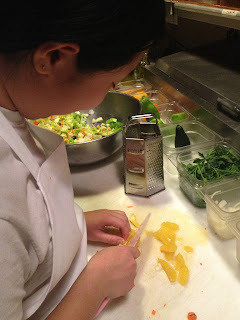 My duties included preparing various menu items and weekly specials. I became an expert at cooking the classic Spanish omelette, the Tortilla Española (find a recipe here). Fun items that I also helped to make included pâté and our house-made Spanish blood sausage, morcilla. On Tuesday nights, I was in charge of the cold and brick oven station. This included serving up our suckling pig special, cochinillo asado, cooked in the brick oven and served on Tuesday nights from October - May. Taberna de Haro is located at 999 Beacon St., Brookline, MA 02446. We offer authentic Spanish cuisine, including tapas, entrees, wines, and cocktails. Enjoy the rest of the patio season while it is still warm out, and look out for our roasted suckling pig, winter, and brick oven dishes returning in October! Visit the website and sign up for the newsletter for more information and to stay up to date about events. 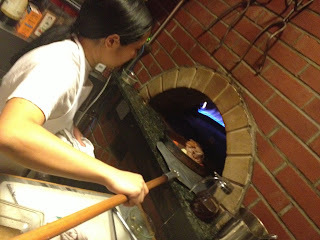 Although I will not be returning as a cook in the fall, I will still be serving at Taberna de Haro. Come by and say hello! I will also be continuing my position as a CSA Distribution Coordinator at Waltham Fields Community Farm until the season ends in the end of October. Finally, I am looking forward to beginning a Master of Science in Food and Nutrition Program at Framingham State University this fall!